Today is a great day. The weather is beautiful here in Florida. The sun, outside my office window, is shining. The sky is blue and riddled with cottony white, fluffy clouds, and yet I sit feeling nervous, and I ponder what to do. What is it that is making me so nervous, and what is holding me back? Sadly, the answer is simple. My fear of social stigma is making me feel nervous, and it’s holding me back from sharing good news. To help me move forward today, past this fear, I’m hushing the sounds of social stigma by blogging about it. How could a mother write about the illness of her child, especially mental illness? Why must you share your dirty laundry with the world? You don’t know anything about what it’s like to live with a mental illness so why write about it? You are not a real author. Your book won’t matter. First, in response to my fear, “How could a mother write about the illness of her child?” Why would I be any different from other authors who have written about their children who happen to live with a physical and/or mental illness? I think it’s important for parents to share how they cope as parents when faced with the physical and/or mental illness of a child, if they feel inclined to, because their knowledge may help another parent. Parental advice, based on experience, can be priceless. Also, by opening up and talking about my experience, other parent’s learn that they are not alone. Again, this can be priceless for parent’s who may feel that they are battling life alone. Second, in response to my fear, “Why must you share your dirty laundry with the world?” To me, the concept of airing dirty laundry is blatant stigma at its best. Because of stigma, many of us want to hide our thoughts and feelings from the world. When we talk about our experience(s), we learn that we are not alone, and we can begin the process of learning what others have done to cope. I believe that opening up and sharing our stories helps us garner support that can help carry us through some of life’s toughest challenges. Third, in response to my fear, “You don’t know what it’s like to live with a mental illness so why write about it?” This is just incorrect. In fact, I do know what it’s like to live with mental illness. I’ve experienced depression, OCD, PTSD, and I live with anxiety. Therefore, I can relate. Fourth, in response to my fear, “You are not a real author. Your book won’t matter.” Again, this is just incorrect. I am an indie author, and I am proud of this fact. It takes a lot of determination, hard work and perseverance to write, edit, publish and market a book. I’ve done just that, and as a woman, a mother, a wife, and as a friend, I’m proud of my accomplishment. And this isn’t the last book that I’ll be writing. 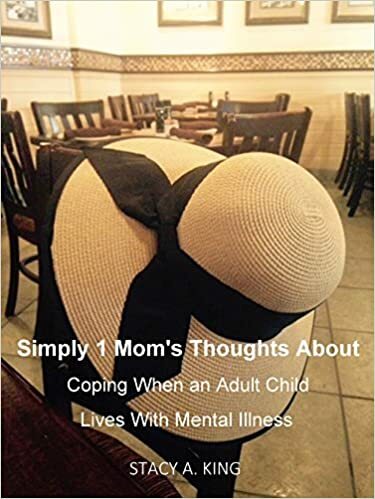 I’m proud to share with you that this first book, Simply 1 Mom’s Thoughts About Coping When an Adult Child Lives With Mental Illness, is part of a series titled Simply 1 Mom’s Thoughts About…and it’s currently available on Amazon. My book does matter because my family matters as well as families across the globe. I notice, as I’m typing these very words, that the sun is shining brighter than it was earlier. Maybe it’s because I finally hushed the sounds of stigma in its tracks as I’ve quietly revealed that I’ve published my first book. I feel a weight has been lifted. I hope you will join me in this celebration and even consider checking it out! Any likes and shares on Facebook helps me. For now, I have to get back to writing the second book in the series. Oh! And did I tell you, I’m also writing a third book that pertains to travel that I’m excited to share with you in the year 2016!